What soccer shinguards should you select? If you havent read my page on how to select soccer shin guards and what factors to consider click here or click on Shin Guards NavBar button. If you already have or know all this, here are my recommendations for The Top 10 Soccer Shinguards. To simplify, I categorized these shinguards into three groups. Hopefully it will help you make your choice much easier and you'll end up with soccer shinguards that are perfect for you. 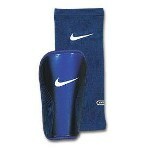 Without ankle sleeves (guards) - "Slip-ins"
All these shinguards are made of highly effective forms of protection. So, I wouldnt pay too much attention to a type of material used for outer casing. Also remember that comfort and protection in soccer shin guards are usually mutually exclusive. More comfort  Less protection. Slip-ins are more comfortable but they dont provide ankle protection. Make sure you measure your shin correctly and select the right size for you (3/4 of a length rule; too small is better than too big). Without ankle sleeves - "Slip-ins"
High density ventilated PE shell with EVA foam padding for durable impact protection. Dri-Fit fabric Backing for moisture-management and comfort. Tip ! The least expensive Slip-ins featuring Dri-Fit fabric. Very light (comfort). Great choice. Quotes from youth soccer players from England and US. Anatomical Shape. Ergonomic fit and superior protection. Anti-bacterial ventilated EVA foam padding. PE shell. Tip ! As light and comfortable as Vapor Lite. Its ventilated EVA Foam works almost as good as Dri-Fit fabric. Plastic hard shell with perforated EVA foam. Size: M:6" Weight: 0.6 oz. Tip ! This is probably the best choice for those whom comfort is the most important. Plastic shells are considered the weakest but on the other hand Adidas Lesto are the lightest and least expensive soccer shinguards. Ultra-durable K-resin shell with Nike Air Unit (extra shock-absorbing material) along shin area. Backing material - self-molding foam features additional shock absorption and reforms with every use. Size: XL:8.5" L:8.25" M:8" S:7"
Tip ! The heaviest of all Slip-ins soccer shinguards. However, it provides the most safety features and could be the ultimate solution between comfort and protection. Form-fitting TPR Technology outer layer. Thermo Plastic Rubber (TPR) fully conforms to the shape of your shin at all times for comfortable protection. ClimaCool foam (similar to Nikes Dri-Fit) offers moisture control, ventilation and additional padding. Tip ! Because it contains all Adidas protective features, it is very costly. On the other hand, its lightweight (for shinguards with ankle sleeves) offers some level of comfort. Estavelo Top gives you a good mix of protection and comfort. Made out of Plastic hard shell and Eva foam backing material. Size: XL:9.5" L:8.5" M:7.5" S:6.75"
Tip ! The lightest of all shinguards with ankle sleeves. Therefore probably one of the most comfortable soccer shinguards of this type for a very affordable price. Ankle guard - removable and adjustable with Dri-Fit fabric. Size: XL:8.5" L:8.25" M:8" S:7" Weight: 5.2 oz. Ultra-durable perforated K-resin shell with Nike Air Unit (extra shock-absorbing material) along shin area. EVA foam with Dri-Fit fabric as backing material. Size: XL:9.5" L:9" M:8.25" S:7.5"
Tip ! It is a very good quality shinguard. Its perforated shell and a Dri-Fit fabric create a cooling system that keeps your shins from getting hot and sweaty. However, I wouldnt recommend it. Not for this price. In my opinion, $40 is way too much to pay for soccer shinguards. I have included it in my recommendation guide, only to give you a variety of options. Special fiberglass shell that molds to the players shin. You simply wet both sides with warm water, secure it to your leg in the desired position and let it set for about 30 minutes. Tip ! It is great technology. Custom fit shinguards definitely must feel very comfortable. But can you afford it? The same technology as Brine Microlite. to secure the shinguard and it is a little bit less expensive. that are basically the same but made by different companies: Parker Osi and Kwik Goal Osi Viper. my advice would be, to get the least expensive ones.